Unfortunately I didn’t get to see my 3 year old nephew who likes Teddy Grahams to have him compare these but I get the feeling he’s not too picky when it comes to second rate versions of snacks. Ethan and I evaluated these on our own. Admittedly we’re not graham cracker connoisseurs, and I’ve never had either of these products but it looked like a perfect showdown waiting to happen. These little cookies are probably about an inch high with a shiny glaze of sugar/honey/high fructose corn syrup. I felt they were a little bland but Ethan said he thought graham crackers are supposed to be bland anyway. So there was really nothing too noteworthy about these, I didn’t really taste any honey flavor but we did both like that they had a good satisfying crunch. Right off I wasn’t crazy about these because they look like this lady I used to work with that would come into my office and complain all day. Although they were larger, we both found these to be even more tasteless than Teddy Grahams. These had the taste and softer crunch similar to an animal cracker. There was some weird, unnatural aftertaste that we just couldn’t put out finger on but we didn’t like it. Teddy Grahams wins for having a good hearty crunch and no weird aftertaste. Other than that they’re pretty bland, but in this case not questioning what flavor you’re tasting is a winning factor. Plus the fact they they didn’t remind me of long days in the office listing to Ruth ramble on about how she gets no respect from her work-study students might have had something to do with it but I do have Ethan’s opinion to back me up on the decision. God, I am sooooo addicted to the chocolate and the chocolate chip ones…I have been known to eat an entire box.. I love love love cinnamon Teddy Grahams! Chocolate and chocolate chip are good too; honey not so much. What is the difference between a graham cracker and an animal cracker? 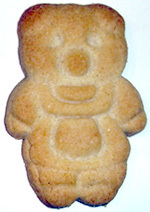 I’ve seen the teddy bear cookies here, but as we don’t have graham crackers there is nothing really to compare them with. 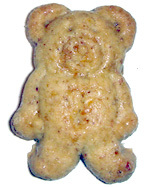 We have teddy bear cookies called Tiny Teddies, but they are more like shortbread biscuits. the chocolate teddy grahams are really good. no question-teddy grahams all the way! i loveeee your site btw! such a good idea. Sweet Pursuit: Graham crackers traditionally come in wafer form rather than in these bite-sized animal shapes. They’re a bit different from animal crackers in taste, although they’re similar in that they’re sweeter than most other types of crackers. I actually eat my teddy grahams with cheez-its. two cheez-its sandwiching a teddy graham. 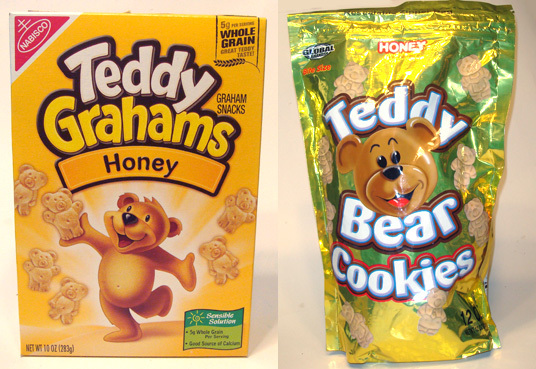 I actually think that Teddy Grams is less bland if you try them in another flavor. I think two other flavors include cinnamon and chocolate. Ok,maybe it isn’t cinnamon,all I can remember is that the kind we usually bought were in red boxes. Oh well. My husband volunteered to pick up some snack foods on his way home from work and kindly asked what I’d like. I asked for some cinnamon teddy grahams. He accidentally came back with the Teddy Bears. The packaging was so similar that I didn’t notice until I pulled one out of the bag. I showed it to him and said “man when did they get so big? !” Then I ate one and just like you said they have a weird after taste. It dawned on me when I was packing some from lunch that the bag said Teddy Bears. He’ll never make that mistake again. They don’t even come close to the taste of Teddy Grahams!